Now that the outdoor spaces are pretty much complete for the Summer season, today I want to jump back indoors to share a project with you that I worked on when revamping the living room earlier this year. This DIY endeavour was something I had always dreamt about, but never had the guts courage to tackle. If you remember back just a day ago… being afraid of failure can put a hinderness on creating something really great. There’s no reward without risk! 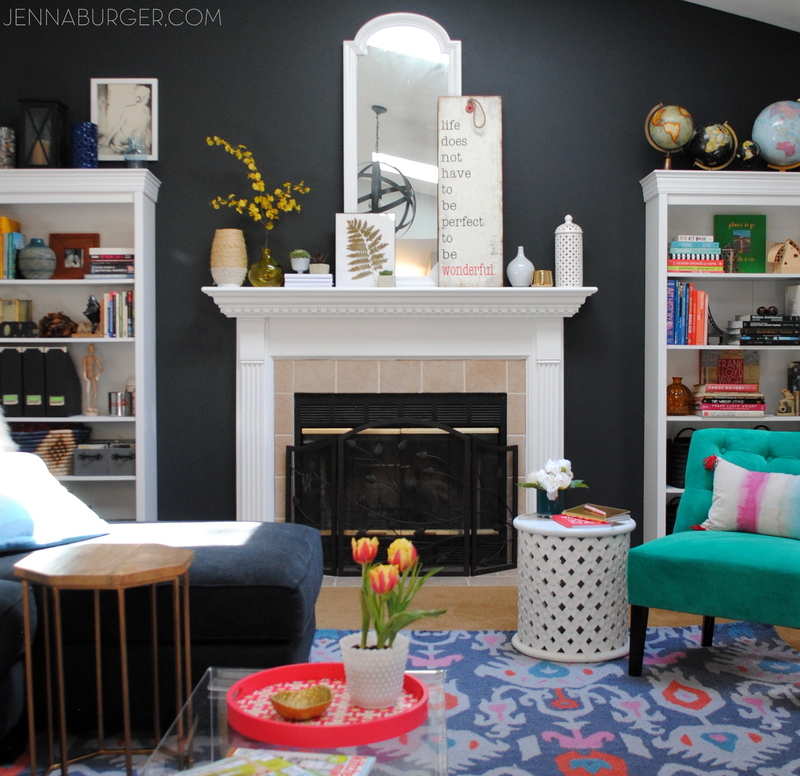 When the time came to jazz up the wall of the fireplace, I knew it had to be built-ins. 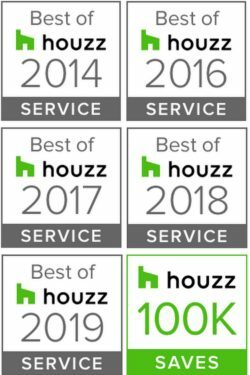 But custom built-ins are major money! 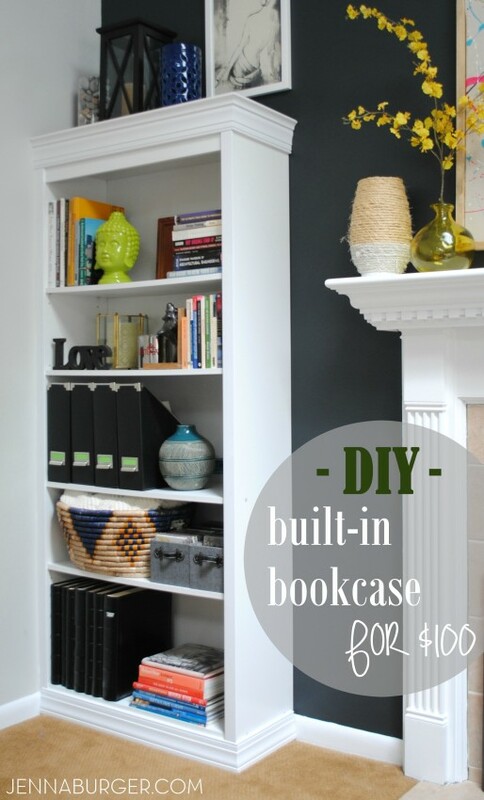 Believe me, I’ve designed many for my design clients and they can cost thousands… I had seen other blogger friends give the very affordable Ikea Billy bookcases a custom look, so I thought I’d give it a try myself. 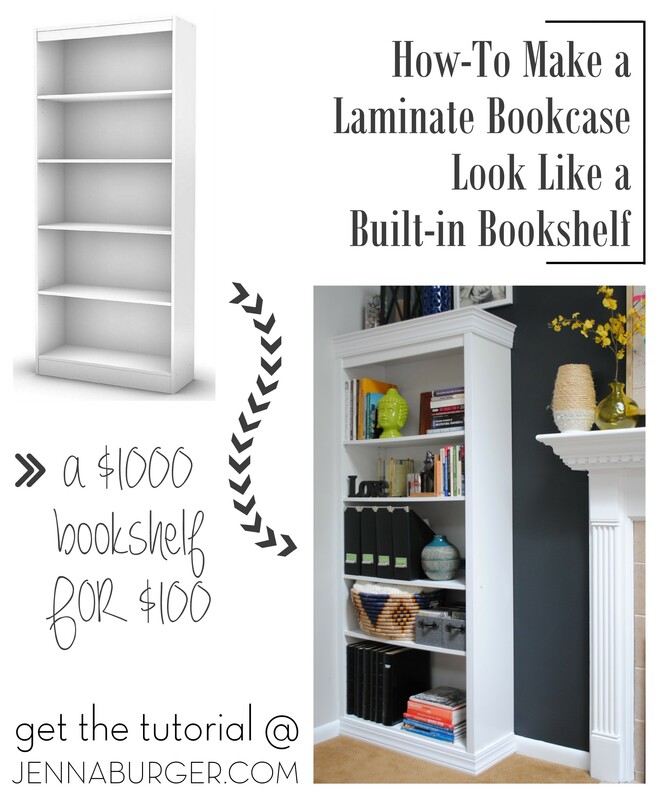 Thus the creation of how I made this laminate bookcase look like a custom built-in bookshelf… times 2. 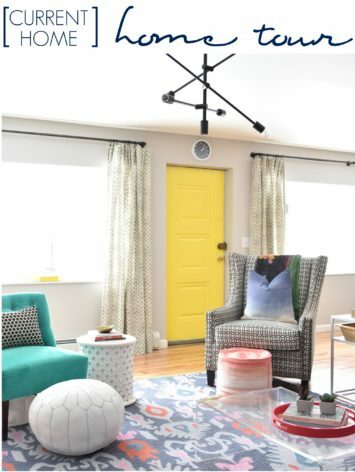 I’m forewarning you… this is a long tutorial (not difficult, just lengthy), but if you’ve ever dreamt of having custom built-ins for your office, living room, or bedroom, then it’ll be worth reading from start to finish. I ordered the (2) 5-shelf bookcases from Lowe’s and about a week later they arrived. 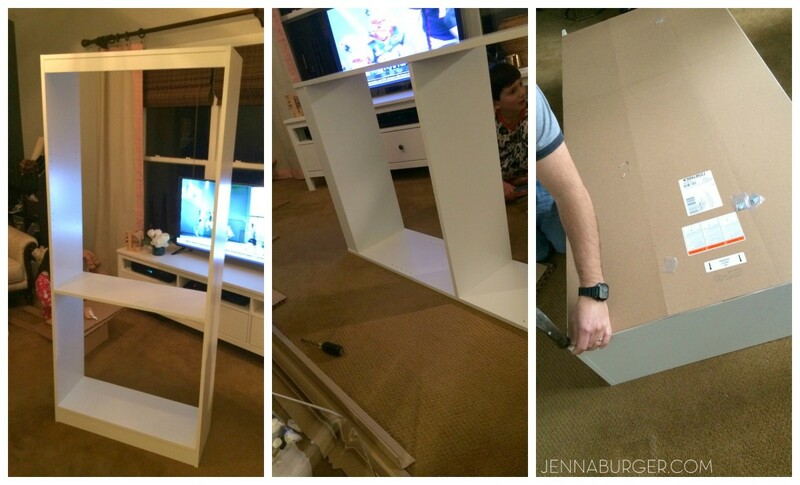 Assembly was very easy – with just 5 parts, there wasn’t too much that could go wrong. Once the top, bottom, and sides were put together, we attached the back so they were ready to set in place. 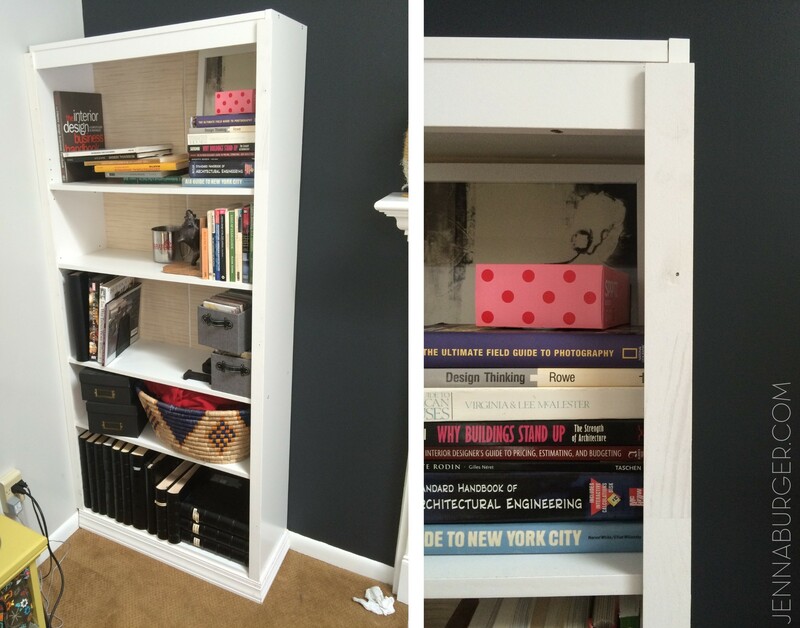 Once the bookshelves were assembled, they were ready to attach to the wall – permanently like a custom bookcase! I measured the side of the bookcase (11.5 deep) and the width (30.75 wide). Then I measured & marked those measurements on the wall. 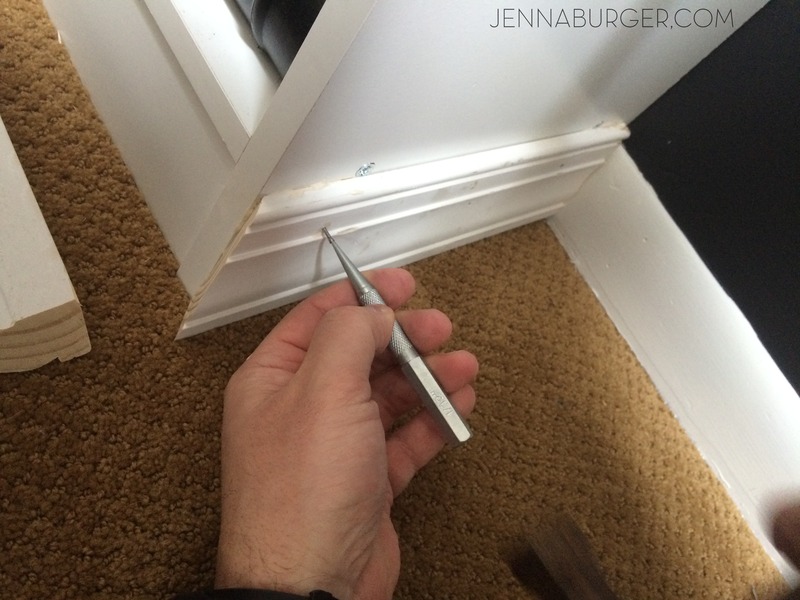 Using a multipurpose tool (like a dremel), I made a clean cut in the existing moulding and with the help of a hammer and crow bar, the moulding came right off the wall. Soon the bookcase would be freestanding no more! 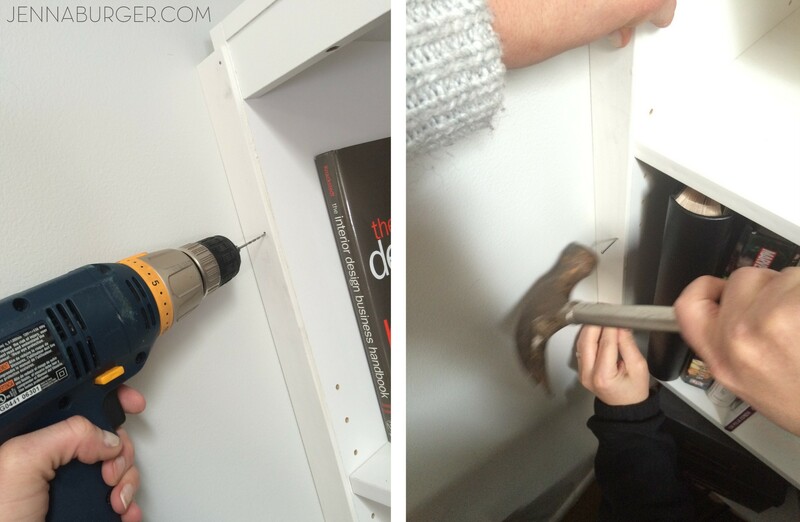 We set the bookcase in place, and using the “L” brackets that came with the piece, we installed /attached them to the top of the bookcase with a cordless drill. This baby is going no where! Not bad, but very plain and typical! I thought it would be best to go from the bottom up, so the Mister and I started with installing the base moulding first. 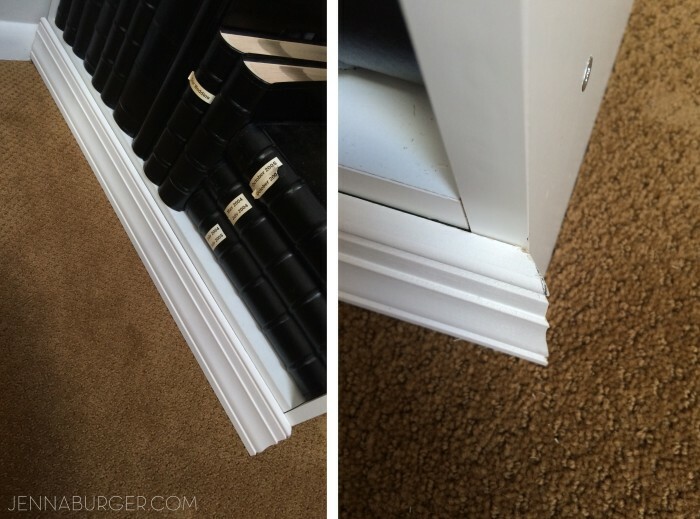 I measured and cut the moulding for the length of the bookcase (the left side had a straight cut, the right side was a 45 degree angle as it wraps around the side). I added wood glue to the back of the moulding, then using finishing nails, I lightly tapped the base into place. That was followed by cutting the other leg for the base moulding and fitting it into place. To “drive home” the finishing nails, I recommend using a nail punch set. 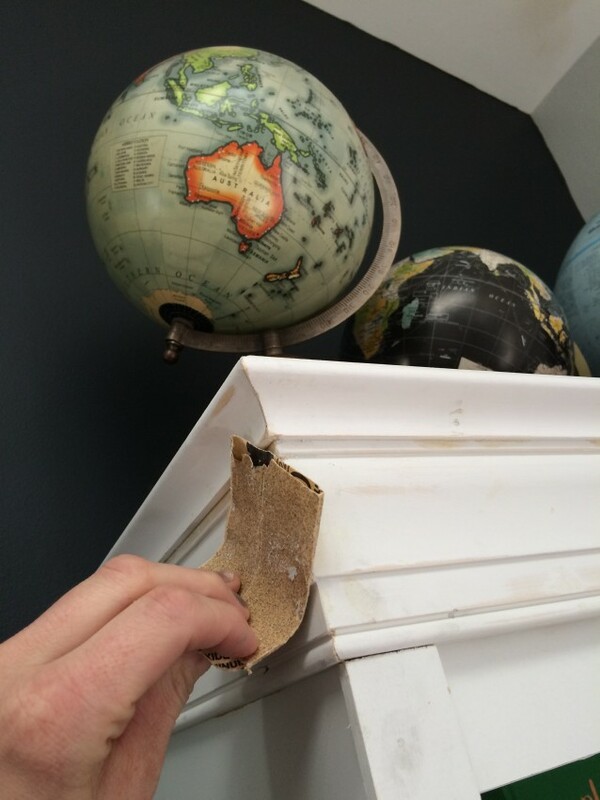 This will allow the head of the nail to be deeper than the moulding, which then can be filled in with wood putty before painting. 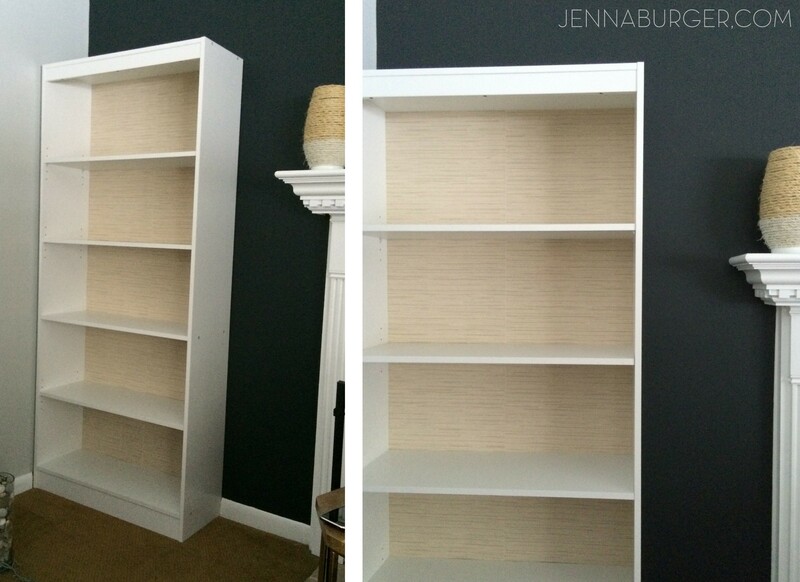 Working our way up to customizing this bookcase, we added sides to the shelf to give it a more bolder, prominent look. I had intended on using 1 x 2’s but was concerned that they would stick out too much. 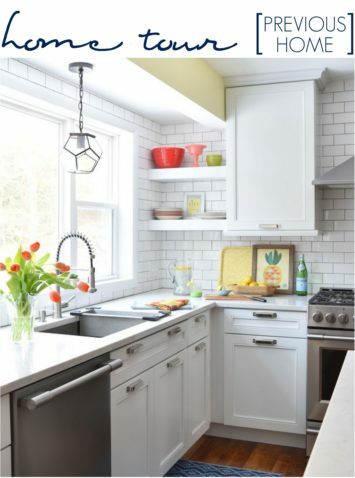 My savior of a husband, found white primed (that saved a step) fencing lattice. THEY WERE PERFECT. 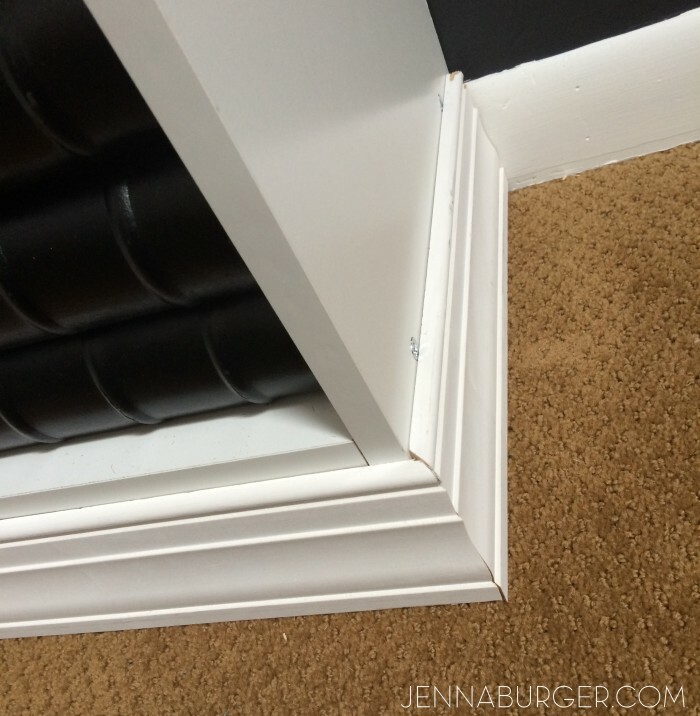 The depth is only 1/4″ and the width is about 1.5″ – perfect for the sides! Because the lattice is thin, we predrilled the holes before nailing them into place – This avoided possible splitting of the wood because it’s thin. 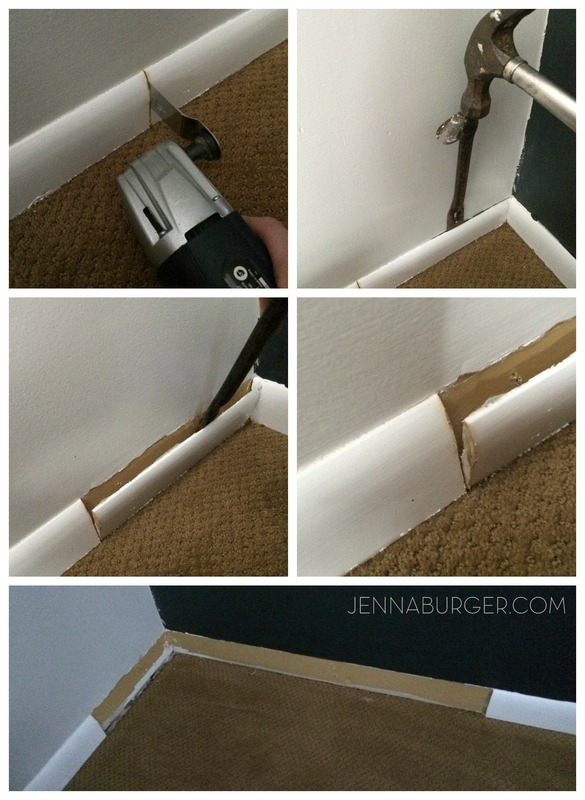 Once the holes were drilled, we added wood glue to the back, and nailed them home! Last moulding steps… The Crown. 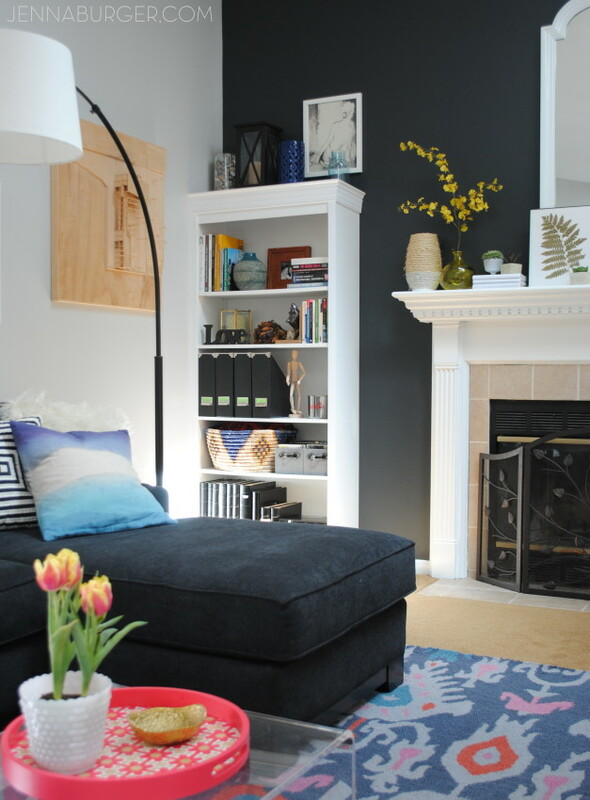 For the crown moulding on the built-in bookshelf, we used the same base moulding but inverted it (flipped it around) and also added an additional piece of moulding to make it stand out more. 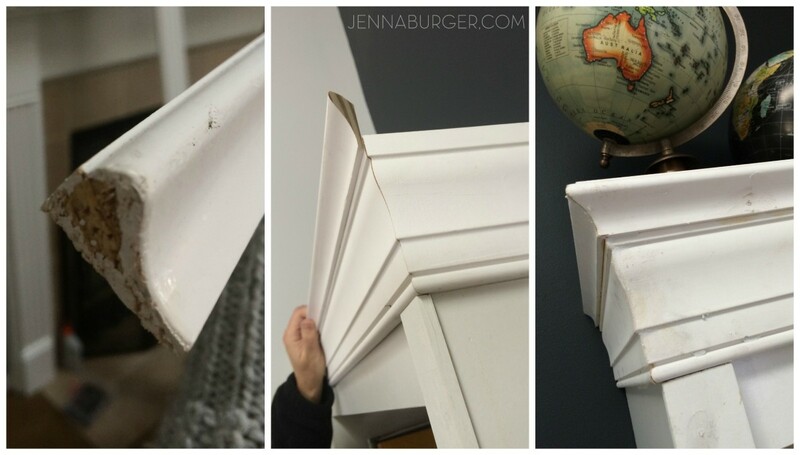 The “crown” (actually base moulding) isn’t a true crown moulding so there are no special angles to figure out – thank goodness! After measuring the length, we simply had to cut the moulding on a 45 degree angle using the compound miter saw. 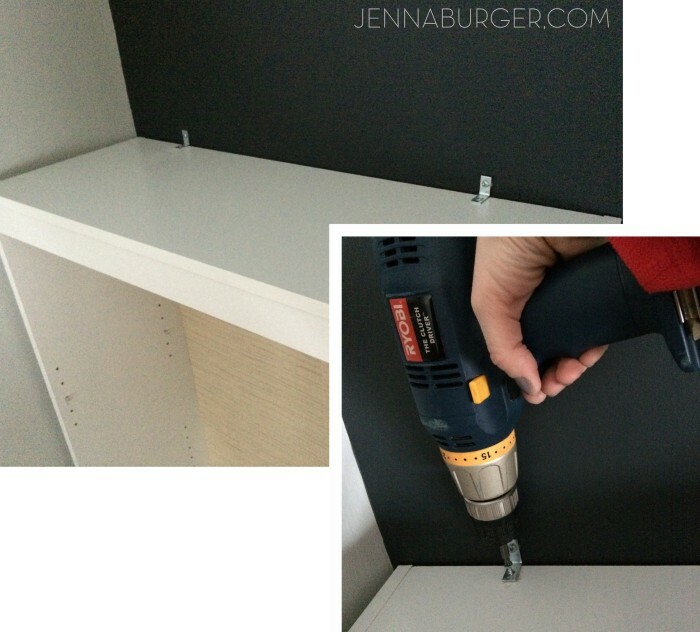 Again when it came to installing, we first predrilled the holes using a cordless drill, then nailed it into place. Adding this crown moulding also made the bookcase even taller = bonus! It looked like a mess after installing, but it’s amazing what wood filler + sanding + painting can do! 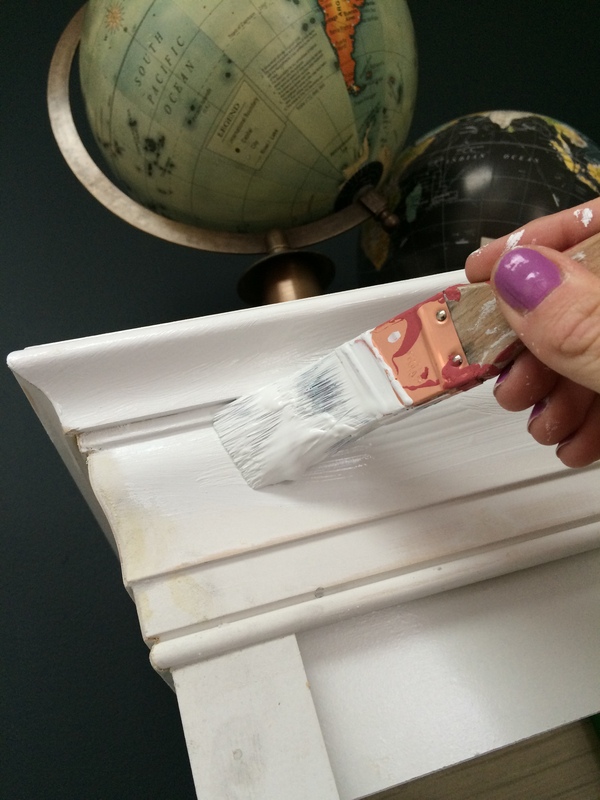 For the paint, I chose a color that was very close to the laminate, so I only painted the new moulding + trim, not the entire built-in. 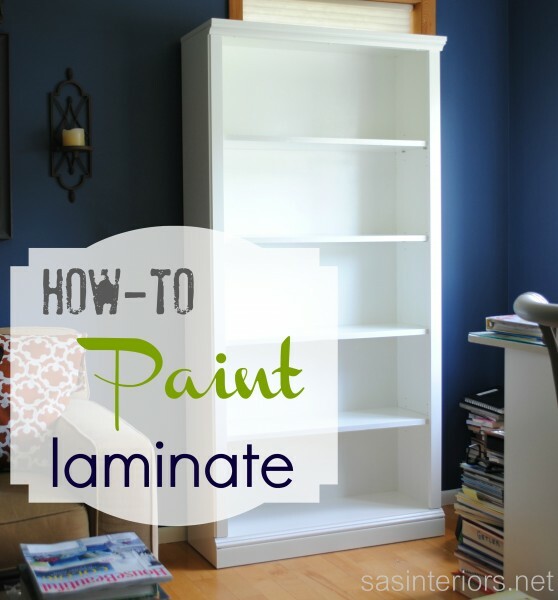 That would have been A LOT OF WORK and you can not even tell there are differing materials (laminate and wood). We didn’t build just one. There’s 2. I certainly don’t want to downplay the work of a true millworker / cabinet maker. Their work far exceeds what I created, but since my option was nothing or DIYing a bookshelf (a $1000 bookshelf is not within my budget), I went with the latter. I am very happy with the result of my built-in version! It certainly isn’t perfect. There are mistakes (remember failures happen), but it’s only something my eyes can see. 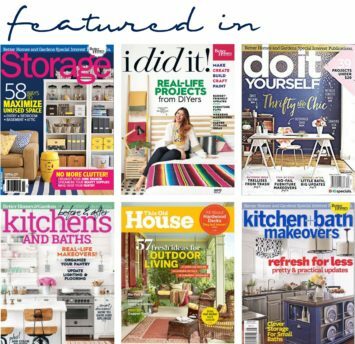 I hope I’ve inspired you with this do it yourself project. 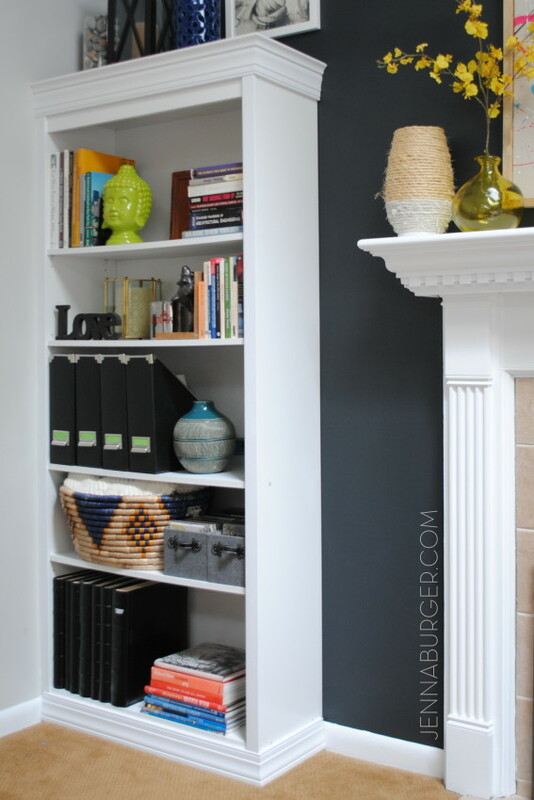 If you’ve never thought a built-in was possible in your home due to budget constraints, think again! Fabulous! It really does look high-end. Wondering though, did you fill in the spots on the sides where the hardware is used to hold the stationary shelves in place? I can’t really tell from the pics. If you did, what did you use and the process? 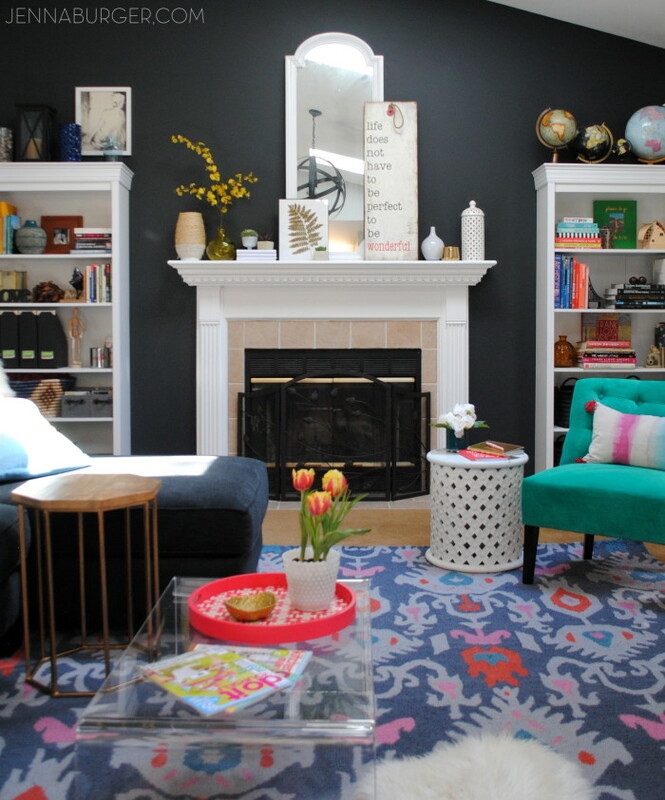 If not, what could you use…just dap some paint over? I love this! I have 3 very plain looking bookshelves in my living room! I think I am going to spice them up!